Nebraska is a state of the central United States in the Great Plains. It was admitted as the 37th state in 1867. The region became part of the United States through the Louisiana Purchase of 1803 and was made a separate territory by the Kansas-Nebraska Act of 1854. Its present boundaries were established in 1861. Lincoln is the capital and Omaha the largest city. Population: 1,750,000. Nebraska's soil has been farmed since prehistoric times, but the Native Americans of the plains—notably the Pawnee—devoted themselves more to hunting the buffalo than to farming, since buffalo, as well as the pronghorn antelope and smaller animals, were then abundant in the area. The Spanish explorer Francisco Vásquez de Coronado and his men were the first Europeans to visit the region. They probably passed through Nebraska in 1541. The French also came and in the 18th cent. engaged in fur trading, but development began only after the area passed from France to the United States in the Louisiana Purchase of 1803. The Lewis and Clark expedition (1804) and the explorations of Zebulon M. Pike (1806) increased knowledge of the country, but the activities of the fur traders were more immediately valuable in terms of settlement. Manuel Lisa, a fur trader, probably established the first trading post in the Nebraska area in 1813. Bellevue, the first permanent settlement in Nebraska, first developed as a trading post. Steamboating on the Missouri River, initiated in 1819, brought business to the river ports of Omaha and Brownville. The natural highway formed by the Platte valley was used extensively by pioneers going west over the Oregon Trail and also the California Trail and the Mormon Trail. Nebraska settlers made money supplying the wagon trains with fresh mounts and pack animals as well as food. Nebraska became a territory after passage of the Kansas-Nebraska Act in 1854. The territory, which initially extended from lat. 40°N to the Canadian border, was firmly Northern and Republican in sympathy during the Civil War. In 1863 the territory was reduced to its present-day size by the creation of the territories of Dakota and Colorado. Congress passed an enabling act for statehood in 1864, but the original provision in the state constitution limiting the franchise to whites delayed statehood until 1867. In 1867 the Union Pacific RR was built across the state, and the land boom, already vigorous, became a rush. Farmers settled on free land obtained under the Homestead Act of 1862, and E Nebraska took on a settled look. The population rose from 28,841 in 1860 to 122,993 in 1870. The Pawnee were defeated in 1859, and by 1880 war with the Sioux and other Native American resistance was over. With the coming of the railroads, cow towns, such as Ogallala and Schuyler, were built up as shipping points on overland cattle trails. Buffalo Bill's Wild West Shows opened in Nebraska in 1882. Farmers had long been staking out homestead claims across the Sand Hills to the high plains, but ranches also prospered in the state. The ranchers, trying to preserve the open range, ruthlessly opposed the encroachment of the farmers, but the persistent farmers won. Many conservationists believe that much of the land that was plowed under should have been left with grass cover to prevent erosion in later dust storms. Nature was seldom kind to the people of Nebraska. Ranching was especially hard hit by the ruinous cold of the winter of 1880–81, and farmers were plagued by insect hordes from 1856 to 1875, by prairie fires, and by the recurrent droughts of the 1890s. Many farmers joined the Granger movement in the lean 1870s and the Farmers' Alliances of the 1880s. In the 1890s many beleaguered farmers, faced with ruin and angry at the monopolistic practices of the railroads and the financiers, formed marketing and stock cooperatives and showed their discontent by joining the Populist party. The first national convention of the Populist party was held at Omaha in 1892, and Nebraska's most famous son, William Jennings Bryan, headed the Populist and Democratic tickets in the presidential election of 1896. Populists held the governorship of the state from 1895 to 1901. Improved conditions in the early 1900s caused Populism to decline in the state, and the return of prosperous days was marked by progressive legislation, the building of highways, and conservation measures. The flush of prosperity, largely caused by the demand for foodstuffs during World War I, was almost feverish. Overexpansion of credits and overconfidence made the depression of the 1920s and 30s all the more disastrous (see Great Depression). Many farmers were left destitute, and many others were able to survive only because of the moratorium on farm debts in 1932. They received federal aid in the desperate years of drought in the 1930s. Better weather and the huge food demands of World War II renewed prosperity in Nebraska. After the war, efforts continued to make the best use of the water supply, notably in such federal plans as the Missouri River basin project, a vast dam and water-diversion scheme. Recent attempts to diversify Nebraska's economic base to reduce dependence on meat processing and agriculture have made Lincoln, where state government and the Univ. 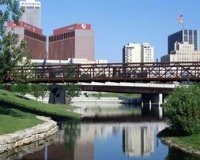 of Nebraska generate many jobs, a business center, along with Omaha. Among noted Nebraskans have been the pioneer and historian Julius Sterling Morton, who originated Arbor Day, and authors Willa Cather, Mari Sandoz, John G. Neihardt, Loren Eisley, and Wright Morris, all of whom have vividly described the state. This page was last modified on 17 January 2013, at 19:18.